A great birthday was had by all! 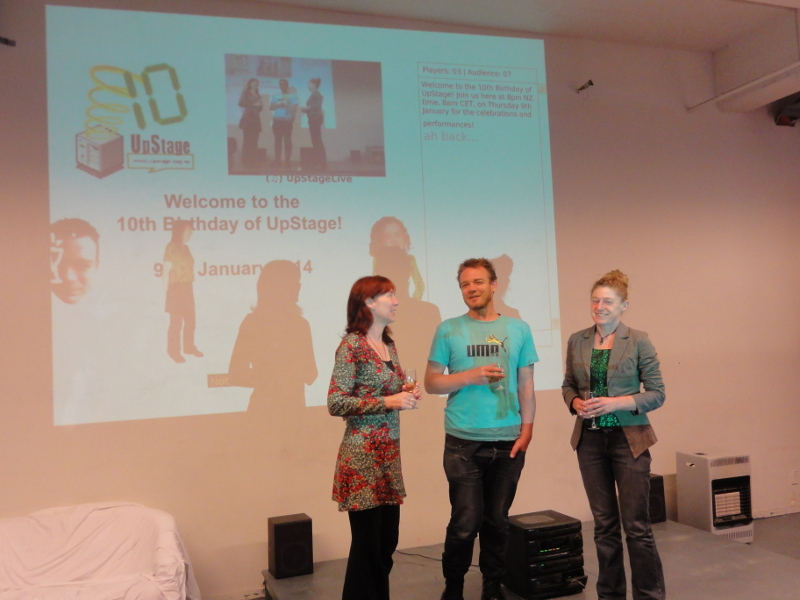 The 10th birthday of UpStage was celebrated on 9-10 January 2014 with events in Wellington (NZ), Munich (Germany) and of course online. 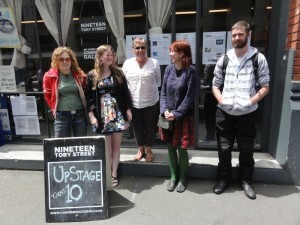 Performances, presentations, a planning meeting and the launch of UpStage v3 were on the programme. 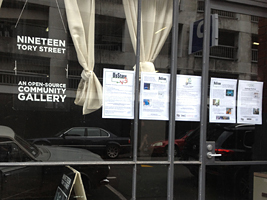 In Wellington, we based ourselves in the open source community gallery, 19 Tory Street, for the two days, with wifi courtesy of CityLink. This shop-front space in the centre of Wellington’s busy bar and cafe district was ideal, our poster display got a lot of attention from passers-by, and we had walk-in guests during the evening party; some people watched the projections from out in the street while others came in to find out more. 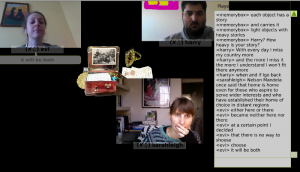 The planning meeting took place during the daytime of both days, with a small but dedicated group in Wellington and several others joining online at different times. 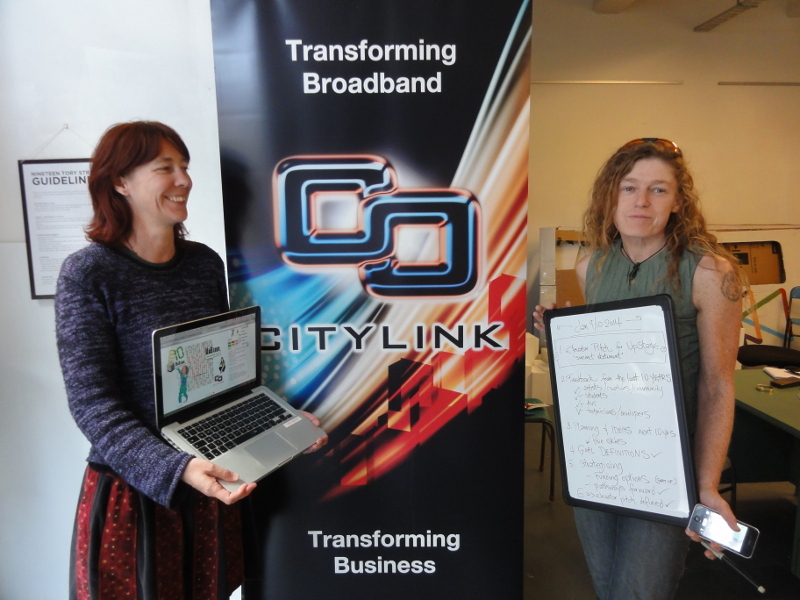 We were particularly lucky to have Anne Philpott from Auckland University of Technology and two of the current student team, Vanessa Henderson and Nikos Phillips, make the effort to come to Wellington for the meeting. A full report on the meeting and its outcomes can be found here. 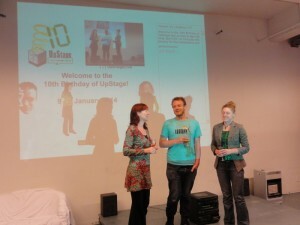 On Thursday evening NZ time, the birthday party was held: three cyberformances had been specially created for the birthday and to celebrate the launch of UpStage v3 – incorporating full audio-visual streaming as well as numerous other enhancements and new features. MC for the evening was longtime UpStager Dan Untitled, and project founders Vicki Smith and Helen Varley Jamieson spoke about the history of the project and the current state of affairs. Professional ribbon-cutter Janet Dunn was enlisted to lead the virtual ribbon-cutting to formally launch v3 into the world. She is pictured at right demonstrating the virtual ribbon-cutting action, which everyone then joined in with, in Wellington and online around the world. With the formalities done, the audience in Wellington were given a quick tour of some of the new features before the three cyberformances began (click here for screengrabs). 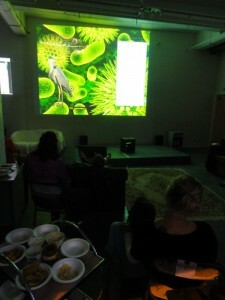 The opening cyberformance was Vita Cyberformativa by Miljana Peric – one of the longest and most active UpStagers, having cut her cyberformance teeth at the first Upstage festival, 070707, and presented work at all but one festival since then. In her trademark playfully theoretical manner, she explored the relationships between artists, mothers and spectators, with an excellent soundtrack. Text input by the audience was represented on the stage, and the show culminated with a salute to the mothers of UpStage, a digital cake and final revelation of the artist herself. Next came Balloon, created by the trio who presented A Plunge in the Pool at the 121212 festival and Flat Earth at 11:11:11 (Petyr Veenstra, Gabriella Sacco and Floris Sirag). Once again audiences were treated to a mesmerising journey through surreal spaces and imagery, accompanied by the haunting voice of a storyteller and a live-mixed soundscape. The third performance of the evening (or morning for those in Europe, which included the artists) was presented by Etheatre and collaborators, and addressed the topic of migration. Beginning with the fact that there are 232 million people living outside the country of birth, the players described their own nationality and current home location and invited the audience to contribute their own stories and experiences – producing a very lively chat and thought-provoking performance. The second day in New Zealand was also the evening of the first day in Europe, and this was when the networked symposium was held. A gathered audience at Signalraum in Munich viewed the performances and heard presentations from Annie Abrahams (in Munich), Isabel Valverde (online from Portugal) and Christina Papagiannouli (online from London); audiences were also watching online from around the country and the world. 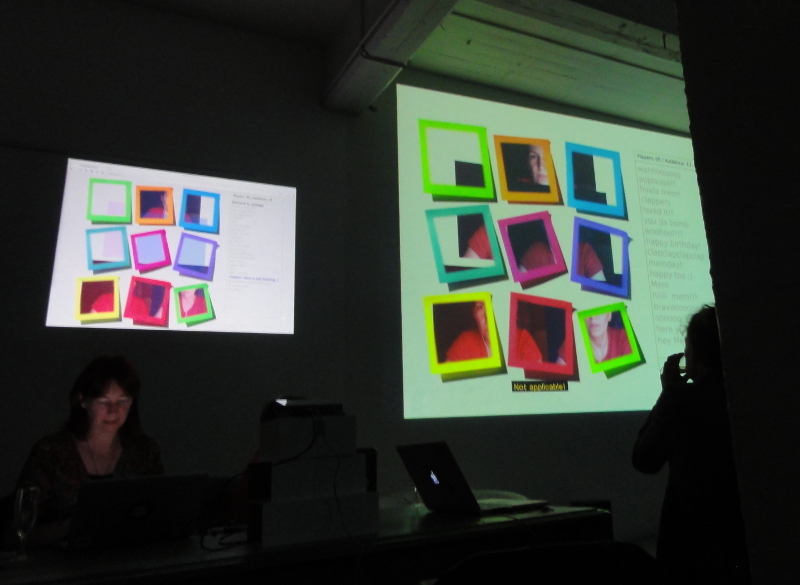 The three performances were all presented again, amongst the presentations, and rich discussions ensued both online and in Munich. The planning meeting continued in Wellington for the rest of Friday; decisions were made, goals set and action points listed. Online participants from New Zealand, Europe and China participated through the IRC and UpStage, listening to our stream and commenting on the Piratepad. It was great to have a variety of input, from the student developers working on UpStage to some of the experienced UpStage artists. A report on the meeting will be available shortly. We didn’t come up with any definitive answer to the best way forward for UpStage, but we did make some decisions about how NOT to continue. 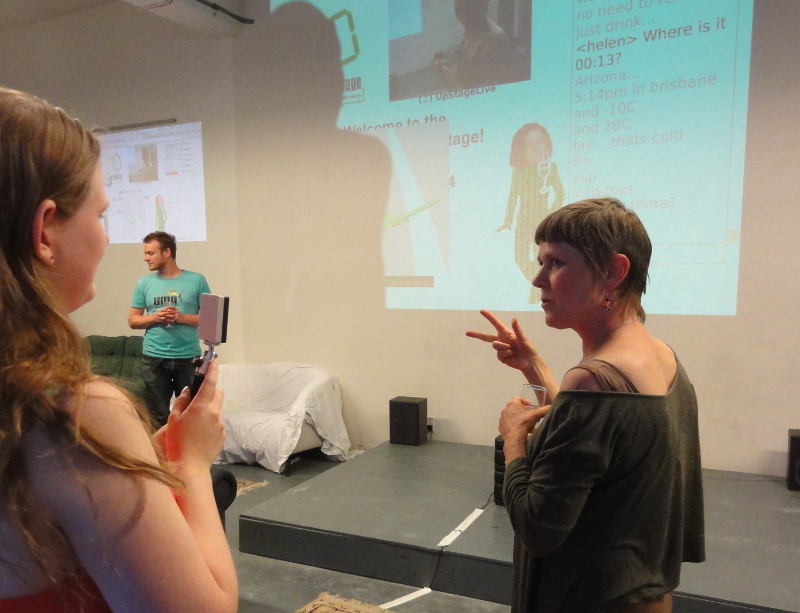 The point we kept returning to is that we need more active involvement from the UpStage community – everyone is welcome to propose ideas and volunteer to do things! UpStage received many birthday greetings and good wishes over the birthday event, including a digital birthday card from veteran UpStager Katarina Djordjević Urosević and donations from Rachelle Viader Knowles, Alessandra Scapin Andrea Aß, Gabi Schmidberger, Sheila Bishop and Furtherfield – thank you all very much! Thanks to our documentary team Francesco Buonaiuto and Simon Lindauer who have recorded the performance and symposium discussions. 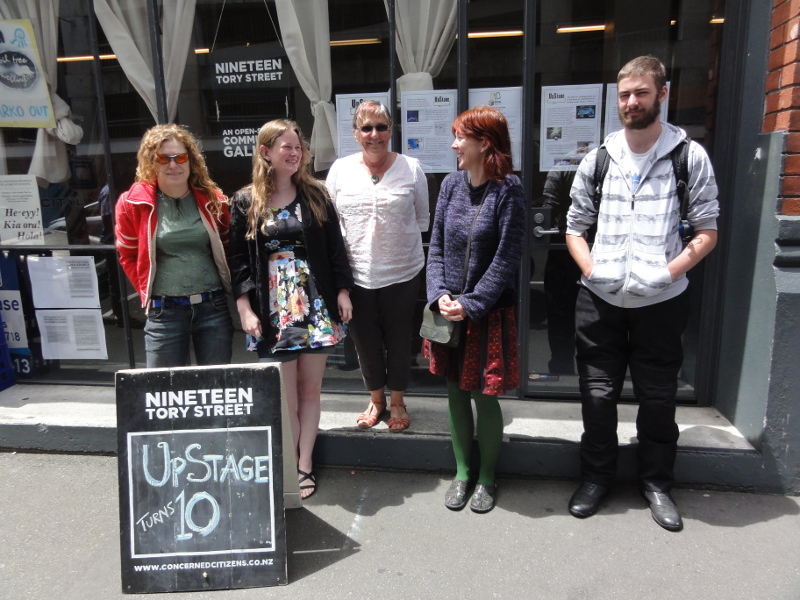 Thanks to 19 Tory Street – the open source community gallery space in Wellington (and Eamonn for all his help and support), also to our ongoing sponsor CityLink, who continues to generously host the UpStage server and provided a birthday present of wifi tokens for the birthday event.